Schaffner News | UK Electrical Distributors – E. Preston (Electrical) Ltd. It is apparent that the medical electronics market continues to grow and that this trend is unlikely to slow down any time soon. Every person who has access to advanced medical care will try to get the best support available and the best treatment possible to increase their quality of life. Due to changes in demographic and social standards, we expect further increases in demand on medical infrastructure within the next few years. The ability to design customer centric solutions for home care or even robot-aided surgery drives engineering to the edge and to technologies inconceivable just decades ago. The central challenge to designers is to improve health without applying any additional risk to the patient. EMC is now considered to be one of the most important design aspects that any new electrical or electronic system design needs to fulfill. It is therefore essential that designers should consider integrating EMC filters as soon as possible in the development phase. Selecting the right EMC filter could save time and prevent additional costs in later stages of the design approval process. 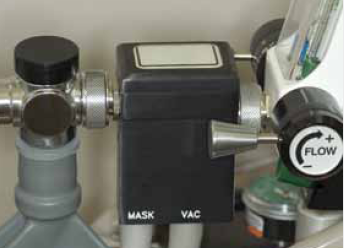 A good example of a medical application with limited space is automated syringe pump. Such pumps are directly attached to the patient through an insulating plastic hose. The medication delivery must be programmable and repeatable; this means that the control logic has to be reliable. That’s why EMC matters in order to ensure the pumps continue to operate as intended without interfering with (or being affected by) other pumps and equipment operating nearby (within a hospital for example). Therefore relevant EMC and safety standards need to be fulfilled. The medical Standard IEC60601-1 focusses on major safety points; some of these are applicable to the mains power entry where Schaffner has a range of solutions. Here Schaffner offers a level of product certification which helps designers to meet the safety requirements of European and U.S. legislations. The approval certificate for Schaffner Filters according to IEC60939-3 includes a section where the filters compatibility to fulfill the requirements of IEC60601-1 is stated. Medical EMC filters also have to be designed to allow the customer to fulfill MOPP and MOOP (Means of patient and means of operator protection) for any medical application. Depending on the level of insulation needed, design of a custom filter solution can be considered. The leakage current definition for electrical medical devices is an important topic which has the same purpose of reducing the risk to the patient. There are number of different connections to consider. The most severe level within the standard is CF (Class C floating type connection suitable for cardiac application) applied part, which is limited to 10µA in normal condition and 50µA in a single fault condition. Considering parasitic effects in a system the filter should not introduce any additional leakage current. However in less critical applications, EMC filters with very low leakage current can be considered as well. Such filters have higher performance compared to filters without any leakage currents. Leakage currents are directly related to the value of capacitors used in filters connected between Lines to Protective Earth (PE) (Y- Capacitors or Cy). Schaffner offers standard solutions for different levels of leakage current requirements. In general the solution for medical applications is the so called B-type filters. These filters do not have any capacitance to PE and therefore do not add any leakage current to the system. It must be noted that the overall leakage current for the whole system needs to be determined, even with a filter which does not introduce any leakage current. With removal of (Cy) capacitance to PE, the overall performance of the filter is reduced compared to the standard filter with Cy. 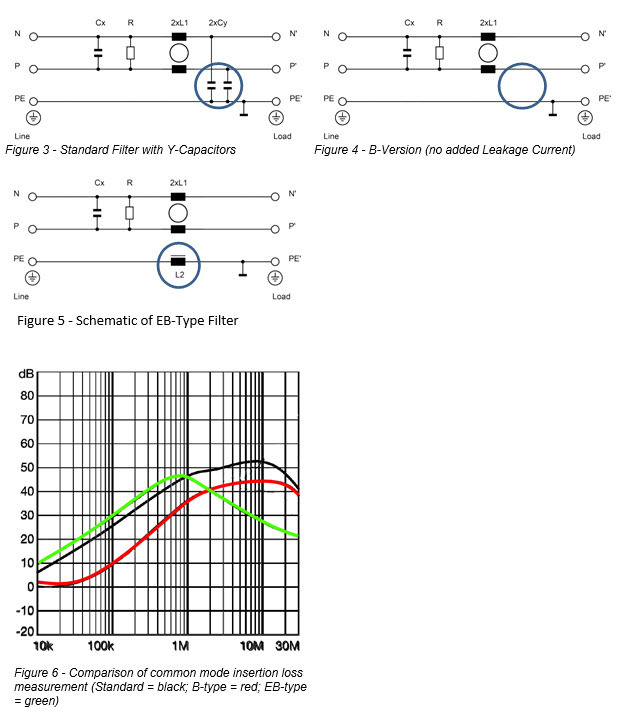 Schaffner also offers so called EB-type filter to compensate some of lost performance as a result of no Cy. In addition to the performance enhancement, EB-type filters increase immunity to electrical fast transients compared to the B-type. This will help customers comply with the IEC/EN61000-4-4 immunity tests. Therefore Schaffner EB-Type Filters can be the best performing filters available in its class for a reliable medical Electrical design. Overall its clear devices should help to increase the health of patient and should not pose any potential risk when applied to a human body. With a Schaffner filter, customers can easily solve their EMC issues and get products certifications without applying any additional risk to the patient. 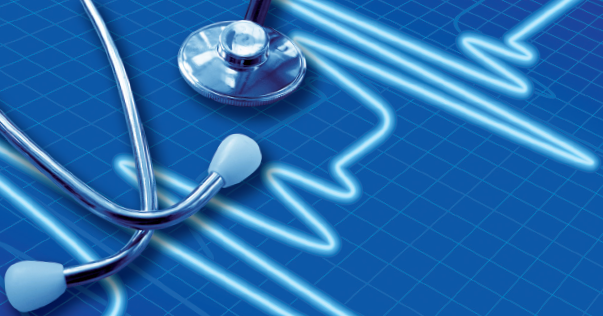 Schaffner not only offers a number of “off the shelf” EMC filtering solutions for medical applications but also works closely with customers who require customized solution. The new ecosine filters FN 3440, FN 3450 and FN 3452 which are designed for three-phase diode and thyristor rectifier, are achieving a THID ≤ 5% even without DC-link choke included in the drive. They guarantee compliance with the toughest requirement of IEEE-519 and other stringent international power quality standards while being the most compact passive harmonic filters available in the market. The filters offer excellent performance at rated power with minimal reactive power, even at partial or no-load conditions. With the installation of the new ecosine filters, the electrical infrastructure is unburdened and its utilization is much more efficient and reliable. 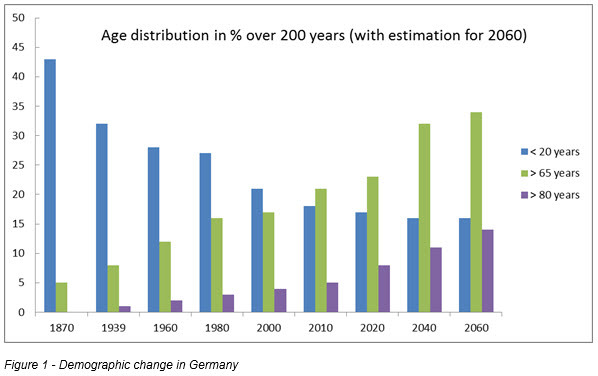 Furthermore, the service life cycle of electrical equipment is extended and energy costs are reduced. Thanks to the modular concept, the filter design also offers great flexibility. It allows Schaffner to provide the optimal solution by merely “plugging in add-on modules”, according to different installation requirements and motor drive setups. Thus utilizing the new Schaffner modular filters allows for the best tailored solutions for applications, aligning product offerings with the international market requirements and customer expectations. Ecosine evo filters FN 3440, FN 3450 and FN 3452 are rated for 50 Hz/400 VAC, 50 Hz/500 VAC and 60 Hz/480 VAC grids, respectively, with standard power ratings available from 1.1 to 250 kW (1.5 to 300 HP for 60 Hz filters). They are available as open frame IP 00 and protection category IP 20 (IP 21 and NEMA 1/NEMA 3R (only in the US) as a future option). All filters are CE-marked, UL listed (pending) and RoHS compliant. The ecosine evo filters are easy to install and maintain and are be fully supported in Schaffner’s well known power quality simulator SchaffnerPQS3. EMC/EMI filters on the AC- and DC side of inverters and converters contribute significantly to the compliance with the EMC directive and do improve the system reliability. Schaffner presents the most compact and most modern products in the market, with the introduction of the new FN221x HV and FN331x HV series. It is based upon the combination of innovative component technology and design knowhow to enable economic EMC solutions between 250 A and 2’300 A.
Schaffner, the international leader in the fields of electromagnetic compatibility and power quality, introduces the new FN 22xx HV and FN 33xx HV standard filters for high current applications for 690 VAC and 1’500 VDC PV inverters, converters and motor drives. These innovative filters are optimized for the requirements of photovoltaic-, power conversion-, energy storage- and motor control systems and take into consideration Schaffner’s extensive global application experience with AC- and DC power systems. Along with appropriately sized 690 VAC EMC/EMI filters FN 331x HV on the line side, the new FN 221x HV DC filters help to meet the limits of binding EMC standards for PV installations in Europe and other regions. Further, the 1’500 VDC filter FN 221x HV will help to increase the service life of the solar panel, improve its reliability, and reduce potential interference radiations of the panel, by keeping away the inverter-born high-frequency and leakage currents. FDIS recently approved the new international CISPR11, Ed.6.0 standard, which defines now the conducted emission limits at the DC power ports of “Grid Connected Power Conditioners”. The extremely compact AC filters FN 331x help to meet the already well known EMC standards and are optimized to suit the most modern inverter design requirements of various power converter types. The new filters will require much less installation space compared to traditional solutions, due to the optimized attenuation performance levels. They also offer minimum power loss related to the rating of the inverter and thus help to maximize the system efficiency. and prolonging their life times. Schaffner, the international leader in the fields of electromagnetic compatibility, power quality and motor drive output filters, introduces the new FN 5060 HV standard dv/dt filter series for 690/600 VAC motor applications. These innovative filters are designed according to Schaffner’s patented concept which enables dv/dt filter damping performance without using resistors or capacitors. This simplifies the installation, saves mounting space and is a reliable long life time solution. The new filters are designed to offer minimum power loss, low voltage drop and thus help to maximize the system efficiency. Several industries can benefit from the use of the new 690/600 VAC dv/dt filter such as the chemical, cement, metal, oil and gas, mining, applications in buildings and infrastructure environments (pumps, fans, HVAC) and other industries. Not only to be used in areas where pumps and fans are controlled by drives with short motor cables, the dv/dt filters from Schaffner are also recommended to be used for applications with frequent braking, danger of flash-over voltage and motors running at high temperature. New and existing motors and installations will benefit from a longer life time and a continuous long lasting operation, if such dv/dt filters are used with variable speed drives. The standard 690/600 VAC filter series are available with current ratings from 16 A to 1’200 A. Higher or other ratings can be engineered and delivered on demand. All models are CE, UL, CSA and ENEC approved and RoHS compliant. The Schaffner Group has expanded its product range by the single-stage FN9280 and double-stage FN9290 IEC inlet filters. 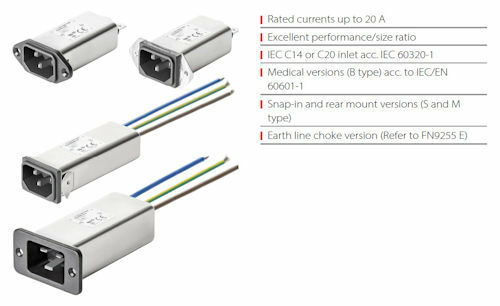 The new EMC/EMI filter modules with type C14 IEC appliance inlet set the benchmark due to their ultra-compact design, patented combined switch and fuse holder unit, the versatile flange mount system for fast and flexible installation and are either deliverable with fast-on or spring cage terminals. Despite the compact design of the filter with a height of only 46mm, the combined unit with dual fuse holder provides extra space for a spare fuse. The dual pole power switch disconnects all poles of the device from the mains and can be removed for maintenance thanks to the integration into the combined unit in order to specifically avoid accidental connection and power-on. For cabling inside the device, the new IEC inlet filters are available with proven fast-on tabs or spring cage terminals for faster and vibration-proof wiring. The new flange mount system with either horizontal or vertical mounting holes provides maximum flexibility for front or back mounting. Because of the RF tight joining of the flange frames with the deep-drawn steel housings an optimal shielding even against strong magnetic fields has been achieved. The FN9280 series is equipped with proven single-stage EMC/EMI filters. The FN9290 series requiring the identical panel cutout has a double-stage EMC/EMI filter with an attenuation of up to 80dB and is ideally suited for applications with higher interference levels. 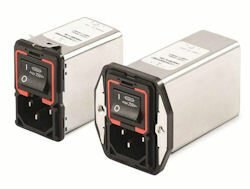 The B versions of both series with a minimal leakage current of 5uA max. are suited for use in medical devices. The FN9280 series can optionally be delivered as E version with earth line choke for additional asymmetric interference suppression. 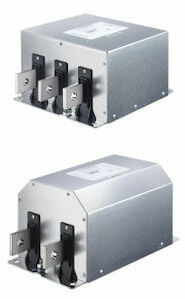 The new series are designed for currents from 1 to 10A with a rated voltage up to 250Vac. They are approved for worldwide use according to UL, CSA, ENEC and CQC and conform to RoHS and REACH. The B-versions comply with the requirements of the active third edition of the safety standard IEC/EN60601-1 for medical devices. Schaffner has added the RB series to its product program of current-compensated chokes. The chokes are available as one- and three-phase designs in horizontal and vertical construction for currents from 16 to 50A. Characteristic of the RB series are the open construction and clear separation of the windings by the use of a new bobbin design. 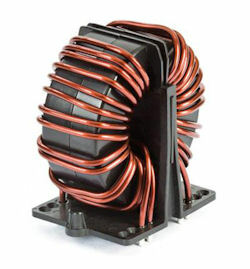 With forced cooling the chokes can operate with up to 80A. 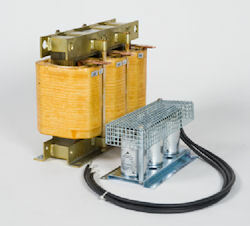 The air gaps and leakage paths are designed for working voltages of up to 600Vac /1000Vdc. Particular value was set on the pin-out of the chokes to permit a simple layout of the circuit boards. A straightforward circuit path design has advantages in terms of losses and noise suppression, especially for applications at higher current levels. An application note also provides important information how to integrate EMC/EMI filters into circuit boards. As a result, the EMC/EMI filtering can be incorporated into the circuit board of power electronic devices, such as inverters for drive applications, for photovoltaic or for charging stations. The RB chokes can be mounted directly to the circuit boards and are thus applicable for electronic devices that are exposed to vibration. RB chokes comply of course with the RoHS and REACH requirements. Three big names for medical applications provides medical OEMs and designers with a broad suite of high performance and reliable Sensors, Switches, Filters, IEC Inlet Filters, Power Entry Modules, Connectors, Circuit Breakers, Fuse Holders, Chokes and Touch Panels used in hundreds of medical applications. Doctors and patients must trust that the medical products they use will perform safely, reliably and effectively. These manufacturers understand the needs of the medical industry and work closely with medical companies to provide the right products for each application. 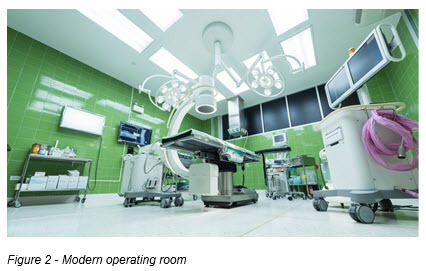 The combination of product leadership, application expertise and stable delivery make these three expert manufacturers the natural choice when choosing the right electrical requirements for your medical applications. E Preston Electrical is a franchised distributor for each of these manufacturers offering long term support for your future needs. 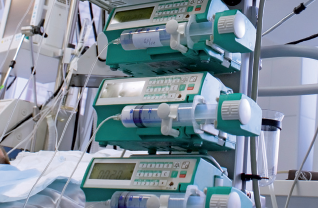 Whatever the application: Infusion Pumps, Respiratory Machines, Anesthesia Machines, Ventilators, Dialysis Machines, Oxygen Concentrators, Diagnostics Appliances; not to mention the many variety of devices required for Therapy, Monitoring or Laboratory applications – all requiring reliable high standard products these manufacturers offer within the medical industry. 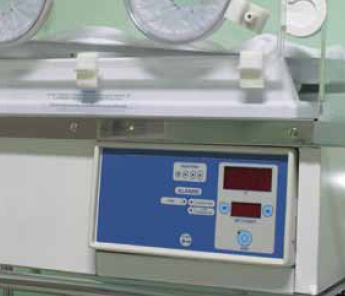 Honeywell, Schaffner and Schurter products are ideal for use in medical appliances, meeting all the typical requirements such as durability, reliability, safety orientation and design ensuring hygiene as well as user-friendliness and maximum functional integration. 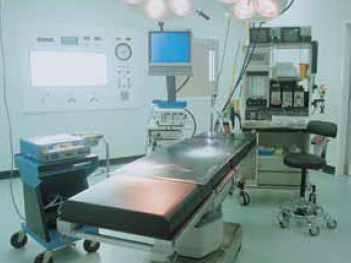 Honeywell, Schaffner and Schurter supports medical equipment manufacturers worldwide, through technically sophisticated and well-engineered products, in their development work. That is why they consistently align innovation process with the technological trends of this cutting-edge industry. The Schaffner Group has extended its product portfolio of IEC inlet filters to include the power cord range IL13 with integrated locking system. Using an easy-to-operate locking button, the IEC Lock snaps into the IEC mains socket and can be easily unlocked by employing slight pressure to the operating button. This eliminates the effort to mount retaining clips to avoid accidental disconnection of the power cord. The reliability of electronic devices that are exposd to vibration like in mobile applications can thus be increased. The IL13 is also suitable for use with all equipment requiring secure mains connections, i.e. in the fields of IT, medical, laboratory or communications technology. 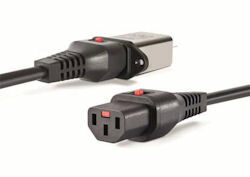 The power cord with the patented IEC Lock System does not require any modifications to existing IEC sockets. It can be used with any Schaffner IEC inlet filter or IEC C14 inlet according to IEC 60320 up to 10A. The cord is supplied in black with a length of 2m as standard. The red marking of the locking button sets the IL13 unmistakably apart from conventional power cords. On the line side the cord can be supplied with different plugs for international use. Of course the IL13 complies with RoHS and REACH requirements and is available everywhere via the worldwide Schaffner distribution and sales network. The FN5040/45 sinusoidal output filters reduce the extra losses in AC motors and help to prevent premature failures and expensive downtimes. They are precisely matched to the technical requirements of modern drive systems and are particularly impressive when used with long motor cables. With the introduction of the FN5040/45, Schaffner, the international leader in the fields of electromagnetic compatibility and power quality, is further expanding its range of products for improving reliability in motor drive technology. The new sinusoidal output filters smooth the modulated output voltage of modern drives and provide the motor with a clean sinusoidal voltage with low residual ripple. This largely prevents premature ageing or destruction of the AC motor due to high dv/dt, over-voltages, bearing currents or overheating due to extra losses. Expensive downtimes are avoided, and premature service or repair is eliminated. The new filters are available in a compact open frame design (FN5040) or as a user-friendly packaged version (FN5045 – IP20). The cable-shield support brackets integrated into the housing facilitates work for the installer and favours savings of installation time and costs. Easily understood application instructions allow it to be safely used even beyond standard specifications, for motor frequencies up to 200 Hz or motor cable lengths up 2000 meters. 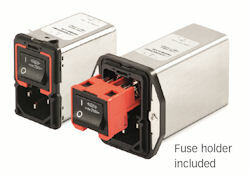 Both models are designed for rated currents of 4.5 to 1200 A and for networks up to 3x 500 VAC (+/- 10%). The UL listing is currently in preparation. Applications in building technology (pumps, fans, HVAC) benefit equally from the use of the new sinusoidal filter, as do industrial applications with very long motor cables or with several motors connected in parallel.